Someone is diagnosed with bowel cancer every 15 minutes, making it the fourth most common cancer in the country. This means that many lives are affected by the disease, both those of sufferers and their loved ones. It’s why we at blubolt are committed to helping stop bowel cancer. 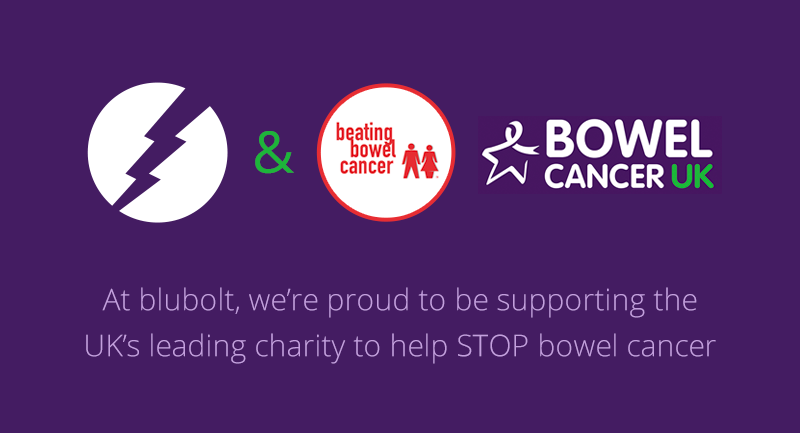 We’ve partnered up with Bowel Cancer UK and Beating Bowel Cancer, two incredible charities that in 2018 became one and collaborated their efforts to be the number one bowel cancer charity in the UK. Their amazing work raises key awareness around the disease, showing that it is preventable, treatable and curable when detected early. We have a number of upcoming events here at the office to raise funds and grow awareness of bowel cancer. Our target donation is £10,000 by the end of this year and our JustGiving Page is up and running and accepting donations! The first event coming up is in March: our blubolt Blood Donation Drive. The team will be visiting a local clinic to give blood, an extremely important effort in the fight against bowel cancer where those affected may need life-saving blood transfusions, whether in the course of their ongoing care or as part of surgical procedures. Our next event is our “Be a Star, Bake a Cake” initiative in April. Everyone here at the blubolt HQ will be whipping up their own batch of baked goodies and bringing them into the office for a cake sale, with all donations going to Bowel Cancer UK and Beating Bowel Cancer. We’re planning to have the sale right outside our offices, so please stop by for a sweet treat and donate to supporting incredible research and lifesaving work to stop bowel cancer. April is also Bowel Cancer Awareness Month so if you’re wondering how you can help then do get in touch and we can suggest tweets for you to share with your social media networks to raise awareness. After all those cakes in April we’re then going to seriously burn some calories with our 10k run in Bristol! Each person taking part will raise funds via our dedicated JustGiving page for the event, all of which will then go straight towards our goal donation of £10,000. Stay tuned for more updates to come and check out our dedicated page for more information on our support of Bowel Cancer UK and Beating Bowel Cancer as well as a calendar of all upcoming events!